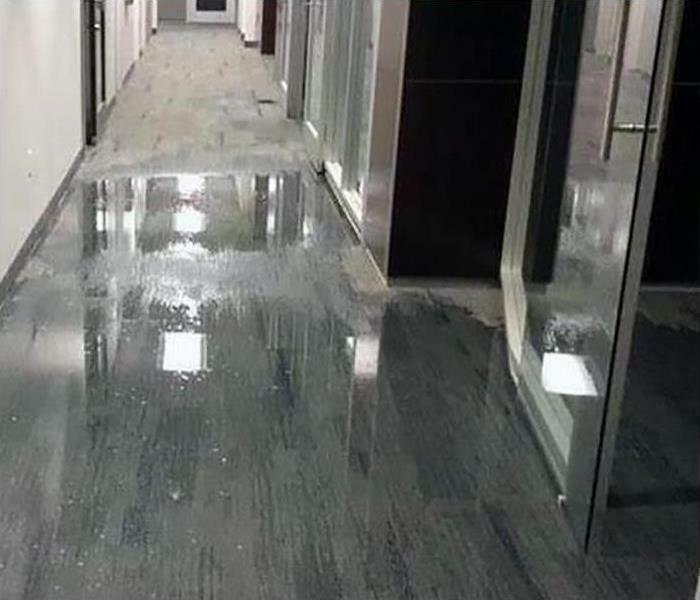 We can restore your water damaged commercial property in Basking Ridge. We are ready 24/7, locally owned and operated, and Faster to Any Size Disaster! 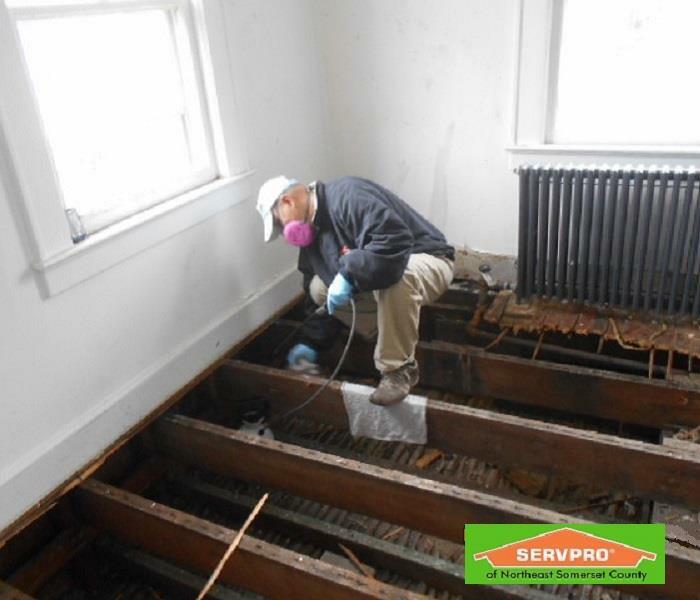 SERVPRO of Northeast Somerset County has the expertise, state-of-the-art equipment, specialized training, and certified personnel to restore your property to pre-damage condition. The groundwater from flooding in Bridgewater soaked this wall in the garage with contaminated elements. 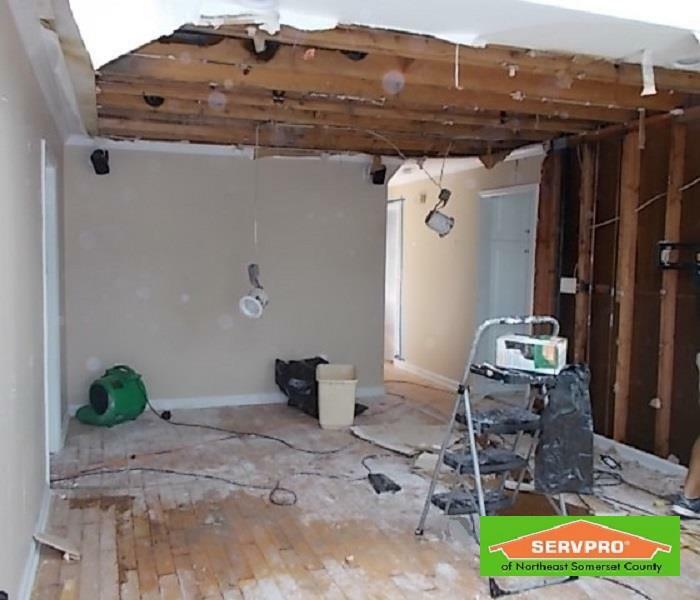 SERVPRO technicians can remove any remaining water and then tear out just the right amount of drywall to treat the exposed cavity with a biocide and to keep the costs down. 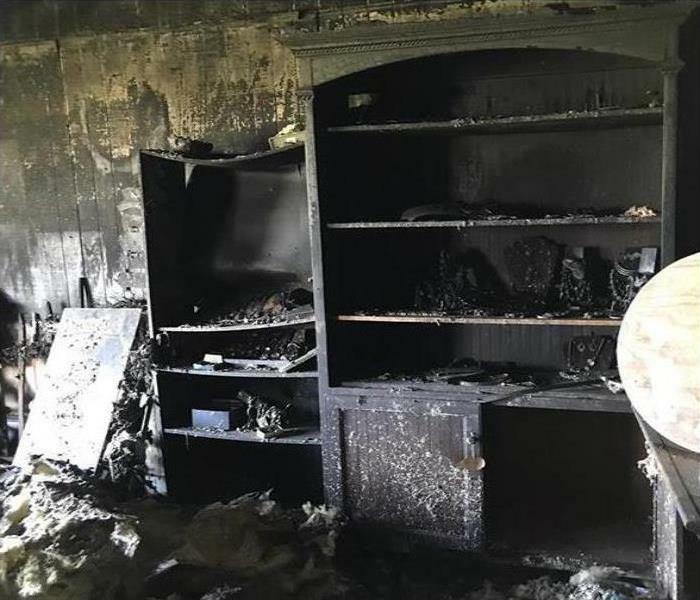 Call our experts at SERVPRO of Northeast Somerset County 24/7 when your home in Basking Ridge experiences a fire damage disaster. Our technicians are IICRC certified in fire restoration, carpet and upholstery cleaning, and other cleaning and restoration courses. Our skilled experts have the experience and equipment to restore your home to pre-damage condition. This picture shows the huge difference made by our professional crew in cleaning a carpet that hadn't been vacuumed in years. Everyone was surprised to discover that it was such a nice blue color! 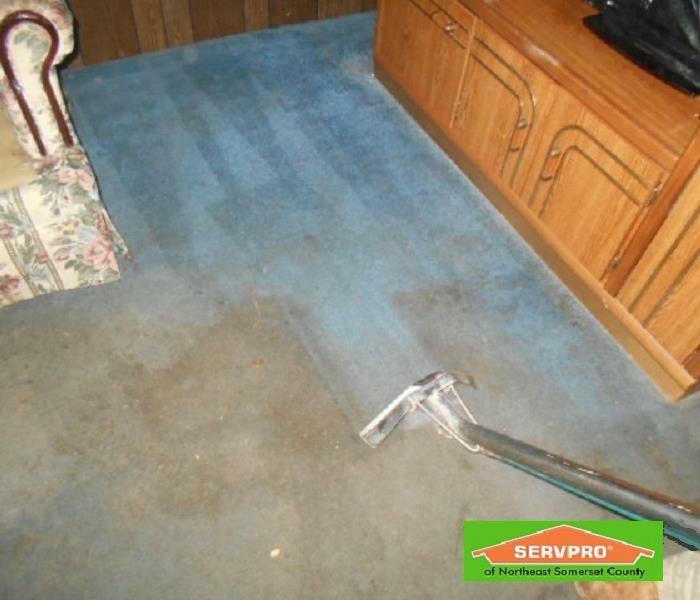 If you need a serious deep clean, call SERVPRO of Northeast Somerset County today. The professional cleaning and drying equipment we use is instrumental to mitigating damage caused by water. 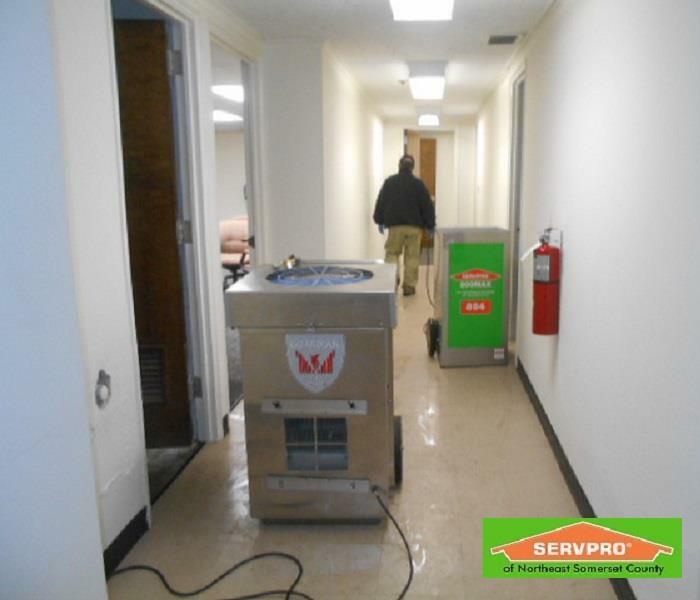 Air movers and dehumidifiers are our primary means of drying out a structure, but when a health hazard such as mold or, as in this case, sewage is involved we add HEPA-filtered air scrubbers as well as Personal Protective Equipment for our crew. Here we have a dehumidifier and air scrubber, with air movers in the surrounding affected areas blowing the moisture toward these machines. Your health and safety are always SERVPRO’s primary concern. In water damages, time is of the essence. 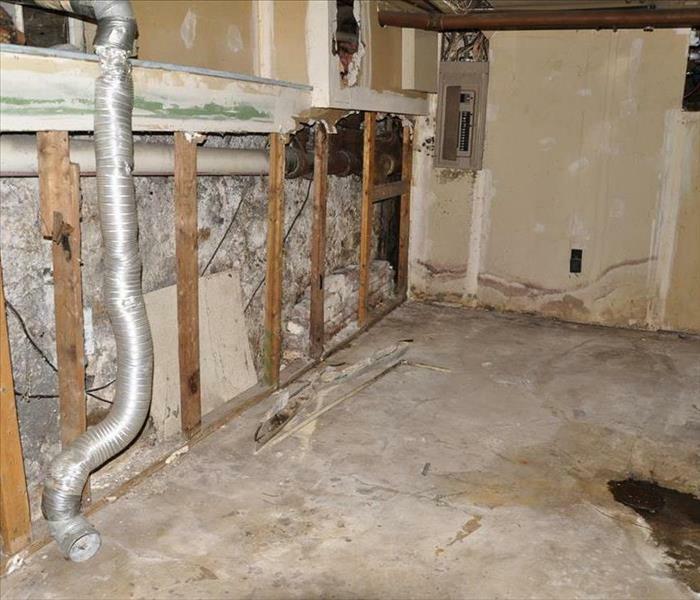 This house was unoccupied so the water sat for a number of weeks, slowly soaking the structure and causing mold growth. The SERVPRO crew first removed the materials that were damaged beyond repair. We then cleaned the remaining structure by hand and using HEPA vacuums. Here, Production Technician Wilber restores the remaining floor joists so they can be used to rebuild. The sooner you call the more affected structure can be saved. It doesn’t take a large source of water to cause a huge water loss. This family in Hillsborough, NJ, was out of town when a pipe began to leak on the second floor. They were gone long enough for it to soak through to the first floor and basement. Once water has been sitting in materials for longer than a couple of days they often cannot be dried and instead have to be removed. SERVPRO’s sensors detect water so we know exactly what is damaged and we don’t take out too much or too little.